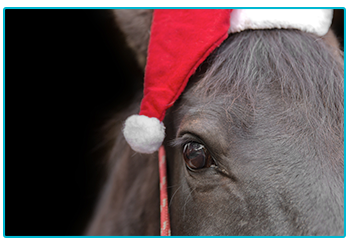 CHRISTMAS GIFTS FOR YOUR HORSE THAT YOU NEED TO SEE! The clocks have gone back, Bonfire Night is long gone and it feels like Christmas is creeping up at an alarming rate! Picking the perfect gift for your loved ones can be hard work at times but it’s well worth it when you see the look on their faces as they open it! For those who own a horse or know someone who is truly obsessed with all things equine, finding a horse-related gift might be the perfect way to please them this Christmas! At The Insurance Emporium, we want to help as much as we can with your festive shopping! That’s why we put together these excellent equine gift ideas! Treats to get them trotting! 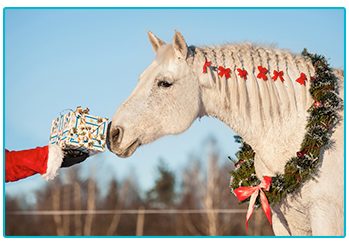 We all love opening up our Christmas gifts to find a whole load of chocolate and other treats, so why should it be any different for our horses! We certainly don’t want to be feeding them chocolate but there are plenty of Christmas-themed horse treats available! You could grab them their own Christmas stocking, such as the Horsebix-stuffed stockings available from Lincoln, or even purchase a Likit Stud Christmas pudding to really help them get into the spirit! 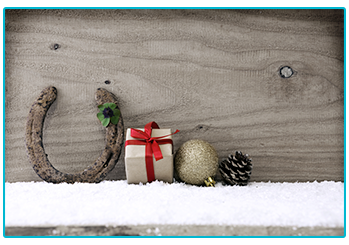 Is there any better gift than one that you and your horse can share together? Purchasing some new gear to use whilst you’re in the saddle could be a great gift this Christmas! If you’re planning on training this summer, a saddle pad could be a purchase that your horse really appreciates! The Back on Track Jumping Saddle Pad is designed to keep your horse warm and relieve muscle pain. A headcollar is another item that you’ll probably use quite often, so making sure that it’s nice and comfortable could be important. The Shires Blenheim leather headcollar could be a classy, and good-looking, addition! Whether it’s new perfume or some lovely bath bombs, Christmas is the ideal time to get stocked up on beauty and grooming products and this is no different for horses! Getting their coat shining with a bottle of Gold Label Aloe Vera shampoo could ideal this winter! If you want to go that extra step and add some glitz to your equine’s Christmas, Equidivine Glitter Hoof Balm could leave you horse looking positively sparkling! Finally, if you’re looking to add an extra shine to your horse’s tail, you could try Carr & Day & Martin’s Canter Mane & Tail conditioner. If you’re looking to buy the perfect gift for the horse lover in your life, there are plenty of options! One great idea could be to purchase a professional photoshoot for horse and rider! For a more practical purchase, a pair of HandsOn Grooming Gloves could be the perfect addition to any horse rider’s kit! If you’re looking to find something with a little more class for your recipient, Falabella Jewellery offer a range of equine-related jewellery that might be perfect for those who are truly horse-obsessed! Whether it’s your own horse or an equine-loving loved one who you’re looking to treat this Christmas, there is certainly a lot on offer when it comes to gifts! You might also want to consider adding some insurance for horses to your Christmas list, helping protect you should the unforeseen happen! At The Insurance Emporium, our Horse Insurance policies include a 20% Introductory Discount* and could include cover for Vet’s Fees up to £5,000 per incident^ if selected as an Elective Benefit. Head to The Insurance Emporium to find out more! *20% Introductory Discount is available for the first 12 premium payments on lunar and calendar monthly policies or one premium payment on annual policies. ^Vet’s Fees cover up to £5,000 on Lunar Monthly policies. This blog is in no way sponsored, endorsed or administered by, or associated with Lincoln, Likit, Back on Track UK, Shires Equestrian, Gold Label, Equidivine, Carr & Day & Martin, Naylors, HandsOn Gloves or Falabella Jewellery.